CD SHOP - Website of Anima Concordia! 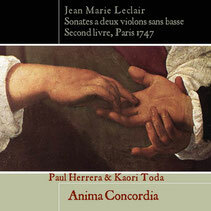 In this new recording, Anima Concordia explore the repertoire that draw a line between musical rivals Jean-Marie Leclair and Italian-born Jean-Pierre Guignon, as well as works by the highly creative and imaginative Guillemain and the lesser Known Roget. 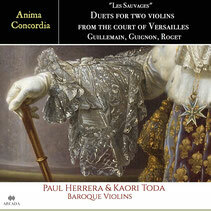 Anima Concordia delight us in the delicate and elegant style of the "French Baroque", an sublime set of sonatas for two. Performed on original instruments. This amazing set of sonatas by its very nature suggest symmetry, intimacy and solidarity. 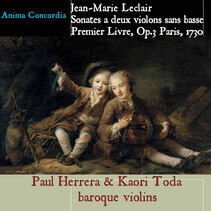 Leclair`s twelve sonatas manifest this ideal in its pure and most perfect form. Liner notes by Michael Talbot. They play straightforwardly and vigorously, with lots of white light separating notes as well as phrases. Fanfare Classical Music Magazine US.